Hey stamping friends! You might think that I have not been stamping much this month. But you would be wrong! I have been stamping away using whatever I felt like using in my stash. 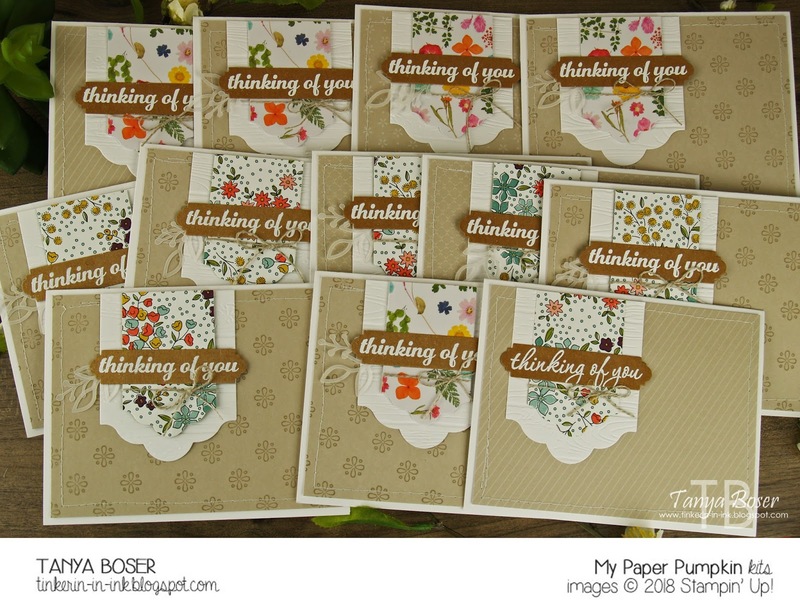 This week I pulled out the February My Paper Pumpkin Kit: Wildflower Wishes. I decided to work on my monthly commitment of 15-20 cards to the church card ministry and use up a kit. Then I got carried away! I made a quick video just walking through all the cards that I made with this fit. I hope you enjoy it! Pinewood Planks embossing folder and a divided tag. The banner die is from the March 2018 My Monthly Hero. What? It was on my desk! 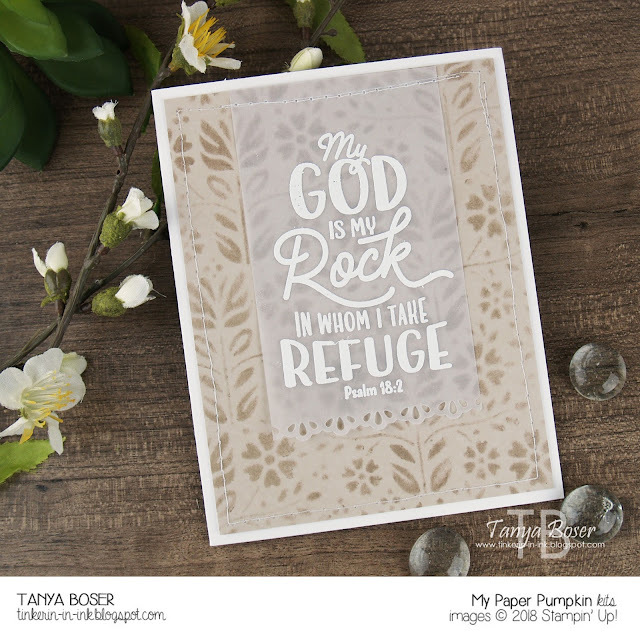 Vellum white heat embossed with the Papertrey Ink Year of Psalms: May stamp. Card ministry does not discriminate, people. Petal Pair embossing folder with Copper heat embossed Papertrey Ink: Year of Psalms May. You can get the Petal Pair folders as a freebie with Sale-A-Bration right now! This one uses a retired Sale-A-Bration DSP (Wildflower Fields 2016) and a retired background stamp called Pretty Pattern. I did say I used whatever I felt like out of my stash. I also made several versions of this card using the printed cardstock mats and patterned paper tags from the kit. I had taken all 9 of the card bases and cut them down to 4"x5½" to use as layers. I just prefer to use Thick Whisper White for my cardbases. I had just gotten an order from Simon Says Stamp and it had the Fold Dance Stencil in it. I sponged the Crumb Cake layer with that stencil and Sahara Sand ink. 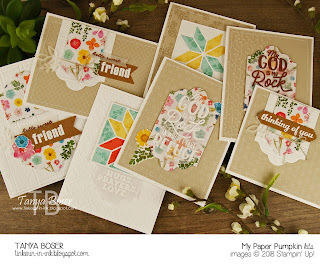 The flower stamps from the kit reminded me of calico, I dug out my Quilt Builder die. I never used it while it was current! Shocking, I know. 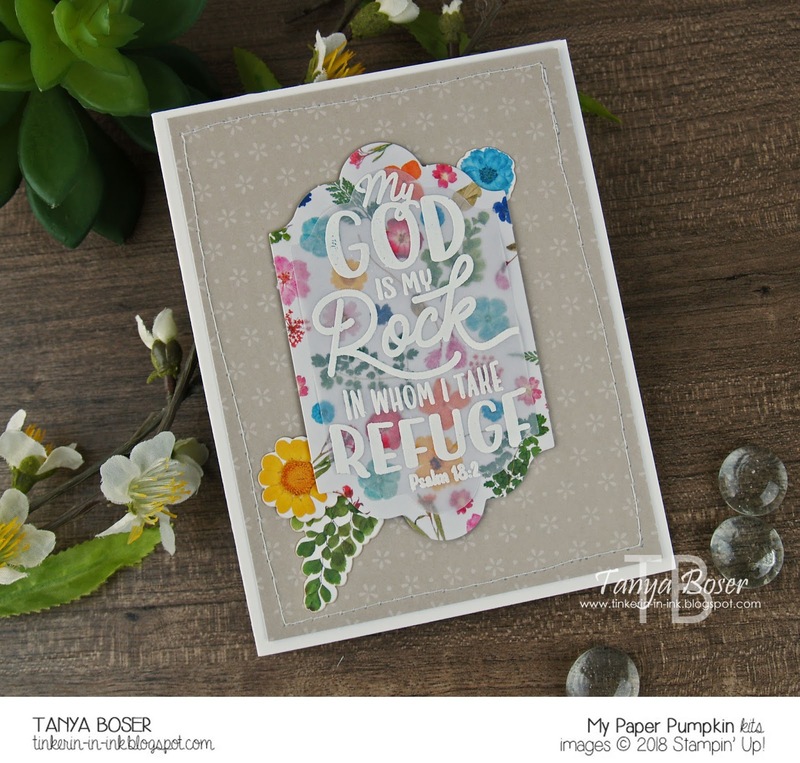 I also used a sentiment for the August 2017 Paper Pumpkin: Giftable Greetings. 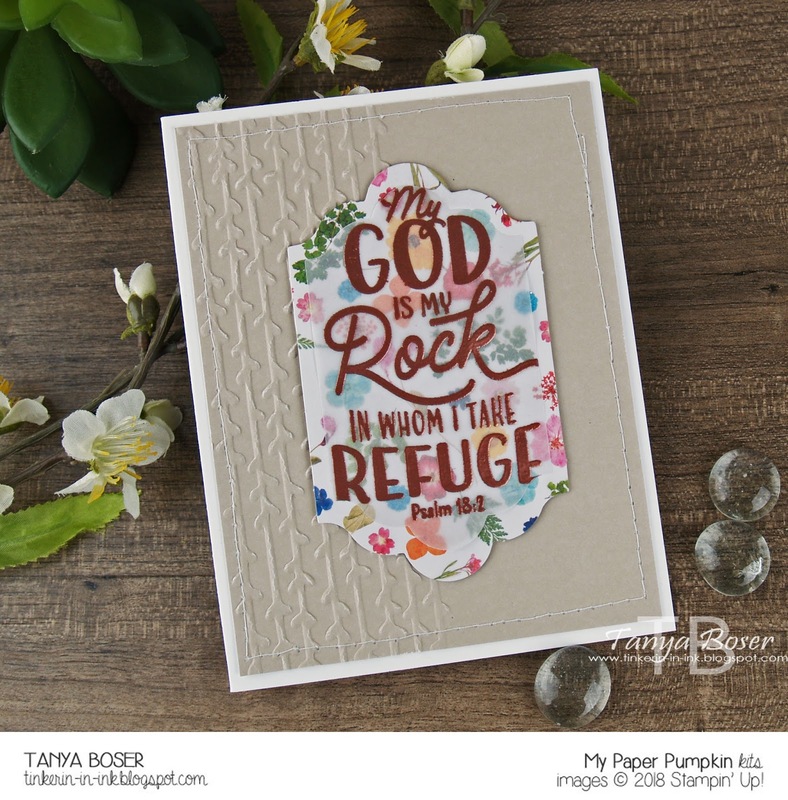 This one adds the Quilt Top embossing folder, which is still current. Yeah me!! And the retired Sending Thoughts set. Here are the dozen cards of the same layout. I think they will do nicely! Oh, and I used the Papertrey Ink Keep It Simple: Thinking of You set for most of these cards.